My relationship with my journal is like that with a family member or a friend I’ve known since childhood. Sometimes we are distant, formal, perfunctory, obliged. But when I really need my journal, it is there with open pages, ready to hold me as tightly as I hold it. These days, I need it more than ever, and I am more intense, more candid than usual, as I scrawl across its pages. I would like to share some of these pages with you but they are heavy going and so I will doll them out a spread or two at a time over a number of days. If you like what you see, come back soon and I’ll have posted more. Here’s where I began. By cleaning up my apartment, on my hands — dismissing the cleaning ladies who had scrubbed my toilets ever since I could afford them — reclaiming what is mine, filth and all. It is part of a process I’ve embraced, of forming a new relationship with the everyday, taking full responsibilty for every aspect of my life. Being married means sharing the good, the bad, the important, the mundane. Patti and I leaned on each other in a thousand ways: she would shop, I would cook. I would bring home checks, she would pay bills. She kept up with our friends, I worked late. It was a deep symbiosis developed over 23 and 7/8 years — which unravelled in a heartbeat. So now I am forced to reappraise all of the decisions we made as a team. Many of them can wait: is that the right shelf to store the wine glasses on? Do we need all of these dish towels? Should we live in New York? Others assert themselves and demand resolution. One by one, I pick them off; making lists, adding bleach, filling my weekends with chores. Every choice is made in consultation with Patti’s ghost, with serious consideration of what she intended, what she thought I wanted, of how to stay true to her spirit, yet accomodate our changed reality. Sometimes it’s terribly sad. Often, it’s a form of companionship that keeps her in my heart, in my pantry, in my thoughts as I doze off. It’s daunting, it’s doable, it’s underway. Wonderful spread, Danny! It’s great to see you blogging. Sending lots of good thoughts your way. Hi Danny, I have just recently come across your blog and just thought I’d say hello. I find you posts beautifully articulate and reflective and I’m in awe of both your ability and willingness to share your thoughts in this way. Looking forward to reading and seeing more. best wishes. Danny the spread is very powerful, with line and color, and the stylized figures at the bottom—the energy comes through clearly. I’m glad you’re using your journal. After 23 and 7/8 years with Patti she’s helped make you the person you are, so that, as you say, it’s doable. Your post is really thought-provoking. I am glad you are surviving, and taking it step by step. The pages are lively and fun! I believe talking to the ghost of one’s life-mate is important. My step-mom passed away well over a decade ago and to this day, my dad still talks with her. She helps him make decisions, and seems to counsel him from the depth of their many years together. I’m so very glad to hear that you and your dear Patti still talk things over. Thank you for sharing your talents, your insights, and this difficult time in your life. Great spread, Danny! Strong and vibrant! I hate cleaning but it’s one of those things that have to be done sooner or later. After the cleaning jobs are done, I always feel much better within myself. It’s wonderful to hear that you still talk things over with Patti. I think cleaning is such a great therapy! If I’m feeling out of sorts and my house is a mess, cleaning it helps put me in a calmer, better way. 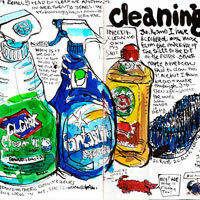 I really enjoyed this journal page, thanks for sharing!!! 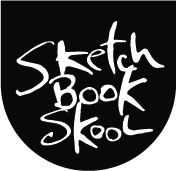 Wondering if you have thought about coming out to the Urban Sketchers Symposium in Portland, OR this July. Would be an amazing thing for me to draw with some of those that have inspired me! Very touched by your post and the strength that shows between the lines. Heartfelt healing thoughts sent your way. Danny, it seems as you are taking life in manageable bites as you and your son go through these most recent days. It is the only way and I am enjoying watching your rediscovery of the everyday. So much sadness but so much joy too. I am thankful that you have that ghost, truly. Life goes on, especially the nitty gritty. These are powerful words, healing words and deeds. Life without Patti, the struggle to cope and find your way back into life. Journaling is a key to feeling the pain and also feeling the life. Thank you for sharing. Sometimes the most mundane daily activities are the best for the soul. Shalom. OMGosh Danny! I know exactly what you’re saying! I still, after nineteen months, awaken some mornings thinking my Frank is making the coffee, and will be coming in soon to gently awaken me, bringing coffee in my favorite cup. (I now drink from his cup.) I suppose after forty years, it’s going to take a whole lot longer than 19 months to get over the absence of his physical presence. He and I shared the workload like you and Patti, I did the cooking – he cleaned up afterwards, I cleaned the house – he took care of the bills and the truck. It balanced out very nicely. Now everything is so wonky. I don’t even want to cook any more, and the blasted truck is total Greek to me! Let’s just keep moving forward, one step at a time, and perhaps someday balance will return again. Sending BIG caring hugs to you today!